Remove branches that are dead or dying. Interfering branches or branches with obvious defects such as longitudinal cracks or fungus can also be removed. Cuts should be made close to the trunk or parent stem, but shouldn’t intrude the “collar” of growth that connects the trunk to the limb. The ideal cut leaves no protruding stub, but isn’t flush with the trunk either. Leaving the bulging collar growth will allow the cut to heal over more quickly. Cuts should be made as smoothly as possible, without tearing the bark or allowing it to peel down the trunk. If the end of a limb is to be trimmed, it should be cut back to a leader of suitable size. Otherwise known as the drop-crotch method, this allows the trimmed limb to heal over because there is already a lot of growth present at the point of healing. The remaining leader should be at least a third the diameter of the pruned stem. Climbing spikes (a.k.a. gaffs or spurs) aren’t healthy for trees and should only be used in an emergency, such as when a climber is injured. Of course, they’re fine for trees that are to be removed. Wherever vines have invaded a tree they should be cut at the base of the tree and allowed to die. Vines will eventually take over the canopy of a tree and kill it, and in the meantime they do damage to the bark, causing rot and allowing animals and disease to enter. People should be discouraged from nailing things into trees. As the tree grows, it will grow over almost anything that is attached to it (It’s not unheard of to find whole electrical boxes or even rifles inside of trees). The bark of the tree will become rusty and contorted around the foreign objects, and it can also be unhealthy. For this reason, when a tree is trimmed, it’s a good idea to pull out all the attached hardware unless it’s being used for something important. Usually a large tree growing near a structure in an urban environment will require a little crown reduction, one or two lower limbs and some deadwood removed, and some interior trimming to bring out the form of the tree to its advantage. Every situation is different so consult your arborist at Boutte Tree for a free consultation. The following are a few of the different types of trimming practiced worldwide, followed by Boutte Tree’s guide to tree trimming. Please contact us for a free quote on work in the Atlanta area. This involves removing some of the small epicormic growth (“suckers”, “water sprouts”) or other small branches that obscure the view of the central trunk or trunks from the ground. 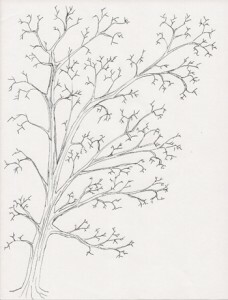 It can make a tree look surprisingly neat and clean, and bring out its strength and unique architecture. But it can also be carried to excess. If one insists on every single small and medium sized branch to be removed for the sake of seeing the larger stems, then the tree will suffer. The harm comes when so much interior growth has been removed that the central stems are exposed to additional sunlight while sustaining numerous small cuts. The above practice is sometimes referred to as ‘Lions’ tailing’, because the lack of lower small branches encourages greater growth at the tips, making the stems taller and weaker. At the same time, all that sunlight hitting the exposed trunks causes the dormant buds to become active and sprout. This results in an ironic self-perpetuating need to do interior trimming often. If the cuts are made incorrectly or repeatedly then the branches or stems can become riddled with decay. This is the easiest way to trim a tree, and it is completely appropriate as long as one understands the goals of this type of pruning. 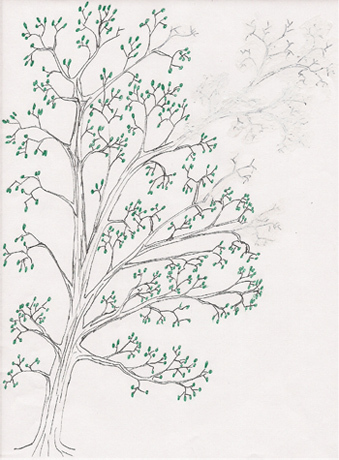 For trees that are very apical this causes the tree to grow taller and keeps the crown at the top of the tree. As the tree matures, it will have a tall straight trunk clear of branches for many feet below the crown, like a forest tree. This is of course very important on timberland where the trees must be straight and clear to be valuable, but it’s not always recommended for trees close to houses because without the protection of many similar trees nearby, a tall tree with its crown at the very top is susceptible to being blown over by the wind. Still, this is a good way to let light into a yard in certain situations, or allow trucks to pass under a tree, etc. Crown reduction is a unique type of trimming recommended for trees with uneven canopies, especially where there are structures beneath the tree. 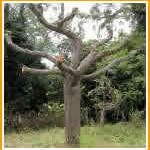 Crown reduction is the thinning of the ends of various limbs or central stems for the purpose of lightening a certain part of a tree or the entire canopy. It lowers the risk trees falling over in storms and limbs breaking in high winds or high load conditions. Crown reduction is not the same as “topping” a tree. Topping a tree means cutting off the top at a certain level. The tree looks unsightly and butchered because the main stem or stems terminate suddenly where the cut is made. More importantly the large cuts associated with topping allow diseases and insects to quickly enter the tree and cause decay. In contrast, crown reduction involves cuts spread out throughout the crown so major stems are not cut off. 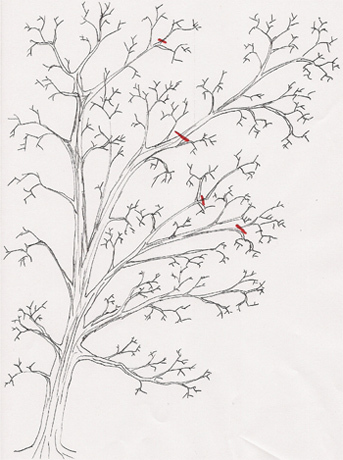 Instead small parts of branches are cut where the branch divides, leaving the tree a way to close off decay-causing organisms and heal strongly. The branches that are removed are usually the farthest ones out. This is because the weight of these branches has the greatest amount of leverage on the branch and in turn, on the whole tree. In this way, weight is removed so as to allow the tree to heal, remain attractive, and keep relatively compact so that it does not become too top-heavy or lose large branches. Crown reduction is a perfect solution for those who wish to keep trees that are especially close to their house or business and do not feel that “trimming up” will suffice to ensure the trees’ health and safety. Crown reduction focuses on encouraging growth lower in the canopy, thus keeping the center of gravity low over the long-term. 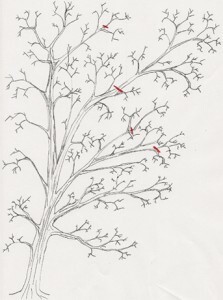 Crown reduction differs from the standard “limbing up” style of trimming in that the lower branches are retained as weight is removed above. However, keep in mind that limbs should not be allowed to touch a structure. They should be kept a few feet from roofs and gutters to allow for proper airflow and prevent mold and mildew. Crown reductions are a desirable form of tree maintenance especially here in the Southeast where storms can bring very high winds. Most people are aware that dead trees are risky to have near a home, as they are likely to blow down in a storm. But what is less obvious is the danger that a healthy tree with a very full canopy may uproot, especially in an urban environment where root systems may have been invaded or restricted. In this scenario, a tree will have a large “sail” area for the winds to catch and not enough anchorage in the ground. It’s easy to be deceived by a healthy canopy into thinking that the roots are very strong. They may be more that sufficient to collect needed nutrients for the tree, but may lack structural strength. Remember, our trees evolved to be in forest conditions, where they were shielded from the wind by neighboring tress. Trees, even if they look sturdy, are not necessarily prepared to stand alone in a manicured lawn. There’s nothing like excellent trimming work to make an immediate visual impact – that’s why trimming is always a tree company’s signature service. At Boutte Tree Inc we take pride in our trees. You’ll notice the difference! When you talk with your Arborist about trimming a tree, he or she should listen to your short-term goals, but should also be able to talk confidently about the long-term expectations for a particular trimming choice. Being an Arborist means understanding the life-cycle of a tree, which can be longer than the life-cycle of the Arborist! So it’s important for an Arborist to understand the way trees respond to pruning many years down the road. The arboriculture industry lacks precise terminology for describing exactly what is meant by various trimming techniques. At Boutte Tree, our most common request is for advice about how to maintain trees to keep them healthy, safe and beautiful. Here at Boutte Tree we use the term trimming to refer to the removal of branches or deadwood for the purpose of making the tree look more uniform or neat, or to keep the tree away from houses, power lines, etc. Though not necessarily detrimental to the tree, trimming often means that due to the demands of safety, construction, etc., large limbs or portions of the tree will be removed to accommodate people’s needs. At Boutte Tree we offer both trimming and pruning services, often mixed together in a job or even a single tree, depending on the needs of the client or the tree! Trimming and pruning account for about a third of our business. We specialize in making trees safer and more beautiful, so you can enjoy mature trees at your home or business. Whether you want to remove limbs from over your roof or allow more sunlight to reach your lawn, we can help you live easier with your trees. Allow us to prune your trees today so that you can rest assured that they will not become hazardous tomorrow. Our certified arborist has the knowledge and experience to give expert advice to our customers. Espalier is pruning a tree to grow two dimensionally. This is perfect for the city where space is often limited. Espalier trees require yearly maintenance so they don’t degenerate into three dimensions. To start an espalier tree, it is necessary to have a framework or reference to use as a guide, and sometimes to hold branches in place with wire to conform them to that reference. This is primarily done with smaller ornamentals, but with patience a large tree can be pruned this way as well. Trimming trees for a view is the art of bringing “the picture,” or the scenery that is being obscured by tree branches, into harmony with the environment. For houses or offices with a view of beautiful scenery, this means allowing the trees to “frame” the view. Limbs and leaves can be cut in such a way that the tree remains healthy and lives healthily, but so that a view is opened up. View work focuses on the view, so trees aren’t trimmed within any particular school of trimming. Instead, care should be taken to ensure that trees aren’t injured by excessive cutting. At times a tree must be removed to affect the view. Take a look from your deck or your bedroom window some day. If you live on high ground, or on a steep incline, you might have the opportunity to cut yourself a magnificent view without cutting down a single tree. Views from a house can raise its value and/or make dawn or dusk a really spectacular show. Perhaps the most interesting off all kinds of tree pruning, people of all ages are fascinated by the gnarled detail embodied by bonsai trees. Bonsai is an art form that originated in China. It involves extensive pruning of both the roots and the branches. Bonsai trees must have their branches trimmed to keep them small and control their shape, and they must have their soil replenished with new nutrients periodically. This is accomplished by re-potting, at which point it is common practice to trim the roots so they don’t become excessively tangled and bunched. Sometimes wires are used to direct the trees into a certain position. Bonsai trees have a distinctive, ancient look to them that is intriguing. At times it is possible to evoke a “bonsai look” in a full grown tree by trimming the branches in such a way that they look more gnarled and old. Indeed, bonsai trees are modeled after the most ancient of trees, so making an ordinary tree look like a “giant bonsai” is nothing more than making it appear older. When some branches die and the trunk becomes more prominent, it’s possible to bring out the twisted trunk or limbs in such a way as to accentuate the age and contorted look of the tree. When an ornamental tree has been damaged it sometimes is better to go for the bonsai look rather than try to make it grow normally again. A vigorous tree will grow over its damaged portions and assume a twisted, weather-beaten posture. Trees can be altered in thousands of ways. In ancient times it was a common practice to pollard trees. A practice that originated in Europe; pollarding starts when a tree is about twenty years old. The tree is cut at many different branch unions at a height of 7 or 8 feet, sometimes slightly less. The cuts produce new shoots, which are in turn cut every fall. The new shoots are always cut back to the same place, leaving the larger branch intact. In time the place where the original cut was made becomes knobby due to the tissue formed at the base of all those shoots. In the old days pollarding allowed firewood to be harvested from the tree every fall, while animals grazed beneath the pollarded trees. Trees were pollarded because cutting the whole tree was impractical; due to grazing there was no way for new seedlings to grow! Pollarding thus allows for multiple land uses, including both grazing and fuel production, while maintaining a (modified) forest environment that supports some forest creatures. Pollarding can be a very effective way of enjoying trees in an urban environment. Pollarded trees can be maintained at the same height indefinitely, making them ideal for placement under utility lines where unchecked trees would be a nuisance and would eventually need to be topped, resulting in tree defects such as decay and weak branch unions. They have a unique, twisted look to them, and they allow plenty of sun in the winter and provide abundant shade in the summer thanks to the new shoot growth! Only some trees can be successfully pollarded, such as the northern red oak, catalpa, and black locust. Boutte Tree can install and maintain pollarded trees for homeowners and municipalities.